In case you haven’t been outside, it’s really cold out today. There is a cold snap currently moving across the country, due to what is known as a “polar vortex”, where basically a cold front breaks off from the arctic circle and travels around. Due to this cold weather, many people are (rightly so) taking precautions. Schools are closed, people are warned to stay indoors and stay warm as much as possible, etc. And that’s not all. There are tips and advice being sent around on how to take care of your house, your car, and your pets in this weather. The Washington Post had a great article yesterday that had some really helpful advice. So, what about your IT? As much as we like to think of our technology being invincible, we know that it isn’t. Extreme weather conditions are going to have an impact on all of our technology, so it is important that we make sure to take preventative measures against the damaging affect the cold weather can have on our tech. It is true that most computer equipment works better in cold conditions than hot conditions. In fact, there are super computers that actually use liquid nitrogen to keep them cold enough to run at peak efficiency. However, that doesn’t mean the drastic temperature drop is good for your equipment. In fact, the extreme temperature change can be just as damaging weather it is hot or cold. 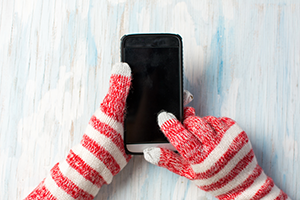 Going from hot to cold can cause problems with your hardware, possibly even causing it to crack. And going from cold to hot can cause condensation build-up. That’s why it’s so important to make sure that all of your computer equipment (especially in your server room) stays at the same temperature. You also want to be careful not to leave any pieces of equipment out in your car today. Don’t leave your phone, tablet, or laptop sitting there for any significant length of time. The extremely cold temperature can cause the hardware to freeze and lead to irreparable damage. If you do happen to be transporting computer equipment or mobile devices that are going to be in the cold weather for any significant length of time, you also need to be very careful once you bring them back inside. Moving from the extreme cold to the warmth can cause condensation build-up on the hardware. Always keep your equipment in a case when you are transporting it. And, once you do bring it inside, wait a few minutes before turning it on, to give it time to dry out. The condensation build-up can be very damaging to the equipment. A good guideline to follow when dealing with computer equipment is this: Cold is good, and consistent is best.